Please post any album reviews for Cry Pretty here! Edit: this is for actual reviews, not interviews with Carrie. Please post print/online interviews with Carrie in the Times section and any radio/audio interviews in the radio interview thread. Carrie Underwood won American Idol in 2005 and unlike other reality TV music stars often do, she has not faded into the background. In fact, she’s cemented herself a place as one of the industry’s top female vocalists. And her latest album, Cry Pretty, is likely to blaze her music trail further. It’s her first album since her accident last year that saw her having to have more than 40 stitches in her face after she fell at home. The title track has already been released and topped iTunes charts in no less than 12 countries. The rest of the album is filled with everything from wistful longing to upbeat, tap your feet rhythms. Tracks like Backsliding remind you that Carrie knows her way well around a big, powerful ballad. One thing’s for sure: Carrie won’t be crying about this one, rather she’ll be laughing her way up all the music charts. MSCarriefan, liz278, quincyeyes and 4 others like this. liz278, quincyeyes, Hil and 3 others like this. THANK YOU FOR THIS! I was thinking of making a thread to compile all album reviews. Kizmet311 and oldyfan like this. Good idea to have one thread for reviews like we did in other eras. Thanks! 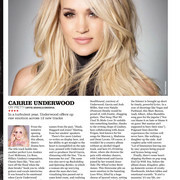 Carrie is featured in the October issue of UK's Country Music Magazine. Read the album review below. Kizmet311 and utlovescarrie like this. Cry Pretty is still stuffed with plenty of fodder for traditionalists. “Southbound” is a feel-good party anthem begging to be licensed by a Gulf Coast state’s tourism board, and “Drinking Alone” is a bluesy, darkly comic waltz about two sad sacks who bond over misery at the bar. Underwood also dips her toe into advocacy with social-consciousness ballads like “Love Wins” and “The Bullet,” which mourns a victim of gun violence. These songs are simple and sturdy but too mushy and equivocal to have any real impact. And outside of the title track and the closer “Kingdom”–a celebration of domestic pleasures, even as life “ain’t always pretty as a picture”–you’re left with little sense of the woman behind these songs. Cry Pretty might boast a new coat of paint, but it ultimately suggests that Underwood has recovered her footing by returning to what feels comfortable. Those who do not believe that Carrie Underwood is currently one of America's most influential pop icons probably did not attend the CMA Fest in Nashville this year. Shortly before, the blonde with the exceptionally good voice released her new single "Cry Pretty", which is also the title track of the new album. That was not all, because the winner of the 2005 edition of the casting show "American Idol" created a new style among their fans with the cover photo and the look in the accompanying music video. At the biggest country festival in the world, the Carrie-Mania culminated in the fact that countless girls could also paint similar-looking tears at a specially erected stand and, accordingly, uniformly watched the performance of the singer in the stadium. Stadium is a good word, because sports fans have been talking about Carrie Underwood for just a few days, as well, albeit with some controversy, as she sings the new song for NBC's Sunday Night Football show, which is watched by millions on TV. As if the series must still be topped, the singer may reveal on 20 September 2018 on the Walk of Fame in Hollywood, a star plaque with her name. Not to mention that it also runs privately: Carrie and her husband expect a second baby. Let's hope that the hype is not "Cry Pretty", the sixth studio album of the singer is too short. Small rock opera to kick off "Cry Pretty"
"Cry Pretty" starts with the title track that Underwood wrote with Hillary Lindsey, Liz Rose and Lori McKenna. Anyone who is familiar with the scene knows that this collaboration virtually guarantees a hit. And indeed Carrie Underwood sings (and cries) into the hearts of the fans. Like a whole series of ballads by Rascal Flatts, "Cry Pretty" begins quietly, then mutates more and more into a bombastic staged, small rock opera, which in the end seems to get louder and louder 35-year-old with her impressive voice volume, in other words, her strong voice keeps the upper hand. In "Low", the singer even puts a vocal on it. Written by Carrie Underwood, Hillary Lindsey and producer David Garcia, the song seems to be inspired by Chris Stapleton, as rarely has Underwood heard such powerful guitars as background music before. The artist keeps the variety factor as high as usual, after the more intense numbers at the beginning the poppy "Southbound" makes for a light moment and also delivers the good-humored partynummer of the record. At the very latest at "The Bullet" it gets intense and emotional again. The moving story is about a mother who has to bury her son and that the bullet that killed him has also hurt a large number of other people who are now mourning the deceased. The following "Spinning Bottles" goes one better. Probably the most intense song of the album deals with the consequences of alcohol dependence. Absolutely superbly performed musically with the great voice of the protagonist and well-measured sounds of cello, pedal steel and keyboard. "Love Wins" is dedicated to the two serious topics of love again. This happens so powerfully that it is hardly possible to resist this positive spirit. Although it is not primarily about the love of God, this is a song of the worship fans should also arrive very well. Conclusion: If the record label writes that Carrie Underwood releases her new pop album, that's no lie. Still, "Cry Pretty" has more to offer than a standard pop CD thanks to a range of gripping titles. In addition, the singer is not a complete departure from the genre as Taylor Swift, so the bottom line on many tracks her heart for country music remains unmistakable. Smokyiiis, jaks_weyn, twaintrain and 3 others like this. Well that is kind of brutal. Kizmet311, rainbow1, quincyeyes and 1 others like this. Seems like they wanted her to tell all her deepest darkest secrets and are disappointed she didn’t. It’s a weird review compared to usual reviews. They don’t like that she said it’s more personal, but it’s not personal enough to them? rainbow1 and quincyeyes like this. countrygram, davistrn and utlovescarrie like this. This critic wasn’t a fan, they enjoyed Storyteller more. I least he had a few nice things to say. And he included that gorgeous performance of Softly & Tenderly. Loved revisiting that. The singer, no surprise, sets off all kinds of vocal fireworks. But as the painfully familiar images in “Southbound” demonstrate — another pontoon boat? — the songs on “Cry Pretty” (most of which Underwood co-wrote) cast these emotions and experiences in such generalized terms that it’s hard to come away with a clear sense of a human in the world. Such a shame that's the only thing they write about and nothing about materpieces like Low or SB. I mean did they listen to those songs?? I mean come on! Well, the headline of this one is off-putting from the second you read it. Why the heck do they have to compare Carrie to Willie? They are in COMPLETELY different lanes in country music. For the most part, they do not have the same audience. So why should her album be anything like his? Now that you have my gut reaction from a headline, I'll actually read the review and see what else they have to say, lol. Ok, the STUPID review didn't get any better. Seriously, reviews like this infuriate me. Why would Carrie mention Willie in Ghosts on the Stereo - he's alive, not dead! I seriously want to scream after reading this review. Yes, they both have albums coming out tomorrow, but why why why must they juxtapose the two in a review to make Carrie's look bad? Why couldn't they be considered independently? TOPDOG1001, MSCarriefan, Hil and 4 others like this. LA Times and NY Times have hated Carrie for years. I am not even going to read them. Let’s hope the other sites give her the credit she deserves. Its Infuriating though. The bash her for not being personal enough when it’s her most personal album yet. They just do t like her and never will. Kizmet311, Suellen, rainbow1 and 6 others like this. Could you guys put the full reviews here, I don't want to give a click to bad reviewers! Lol thanks! Washington Post, USA Today Reviews of Brad's album: Carrie/Remind Me Mention!